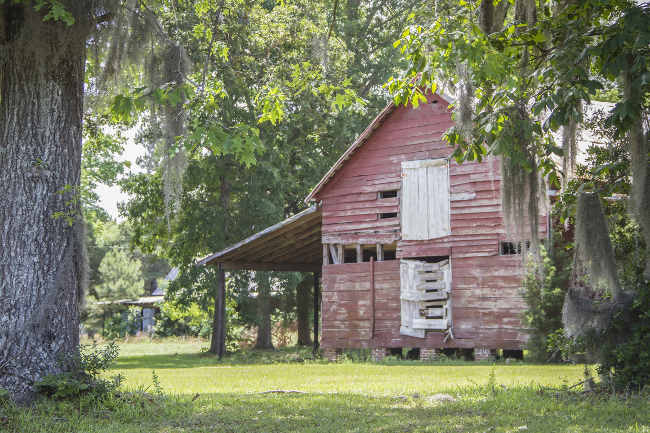 Original plantation lands were located seven miles northeast of the Town of Eutawville off SC 6. The Rocks was originally in Berkeley County, but in 1908 the county lines were redrawn and the plantation became part of Orangeburg County. Current status  Part of the property was lost when the area was flooded. The house no longer exists. Thomas Middleton was issued a grant for 500 acres (11, p. 125). 1745  Thomas Middleton died. In his will, Middleton stipulated the Rocks was to be sold after his death to pay for his debts (11, p. 126, 128). 1794  Peter Gaillard, Sr., known as Captain Peter, bought the property. 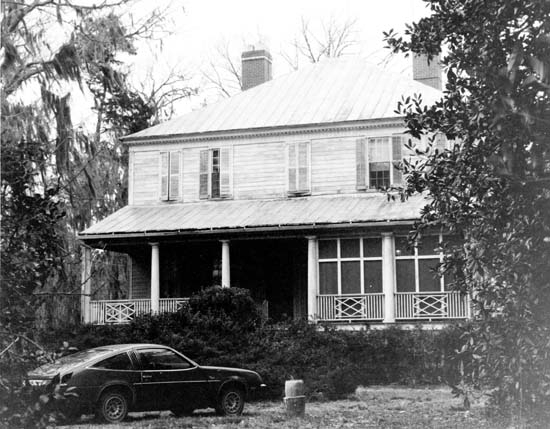 Captain Gaillard was born on Wambaw Plantation (6, p. 14). 1799  Captain Peter Gaillard produced a very successful cotton crop. He averaged $340.00 per hand for his Santee long cotton (hybrid between Upland cotton and Sea Island cotton) (9, p. xxvii). 1803-1805  Peter Gaillard built a house on the property (4, p. 2). 1816  Captain Gaillard retired to Charleston (9, p. 111). 1832  Captain Peter Gaillard made his will. At this time, one of his sons (Samuel) had died so the plantation was to go to his daughter, Elizabeth. 1843  Captain Peter Gaillard died. 1907  Elizabeth (Samuel's daughter) and her husband, James Gaillard, Jr., sold the plantation to T.L. Connor. T.L. Connor later gave the plantation to his son, J. Rutledge Connor. 1927  Plumbing and electricity were added to the house. 1942  The house at the Rocks was moved 1.6 miles to escape the flood waters of the Santee Cooper Hydroelectric and Navigation Project. The rest of the property was inundated (4, p. 3). The house was established on a part of Belmont Plantation once the home of David Gaillard, a son of Captain Peter Gaillard. 1976  Part of the land that was not flooded was operated as Rocks Pond Campground. Several of the plantation's outbuildings were placed on logs and moved to this location prior to the flooding of 1942 (4, p. 3) (12). 1992  The house was destroyed by a fire. Number of acres  500 in 1732; 400 in 1745 (11, p. 125, 126).  Nomination form - PDF - submitted in 1976. Removed from the National Register in March 2000 since house had been destroyed by fire. Anne Sinkler Fishburne, Belvidere (Columbia, SC: University of South Carolina Press, 1949). Information contributed by photographer and historian Brandon Coffey.